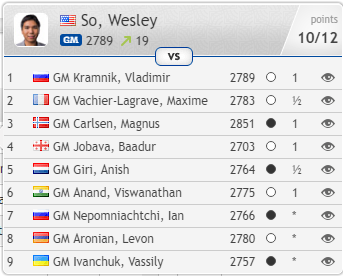 At the end of round 6, Wesley So leads by a full 1 point game (2 points by Your Next Move standards) with 4 wins and 2 draws. 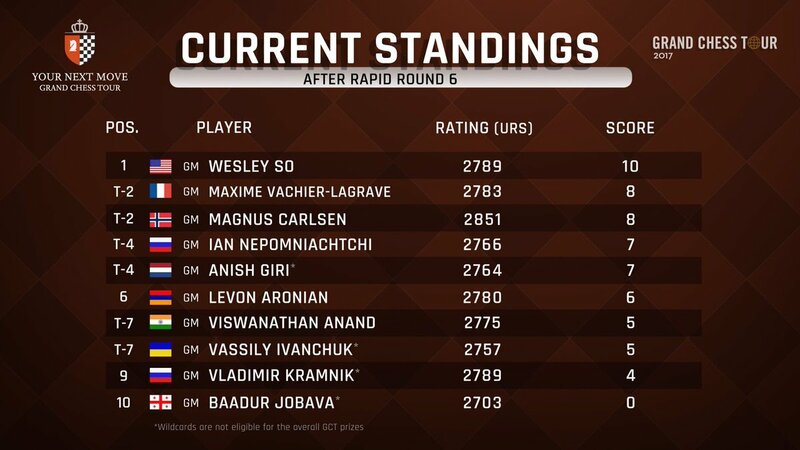 He defeated former world champions Vladimir Kramnik and Viswanathan Anand, as well as the current world champion Magnus Carlsen in the first 6 rapid rounds of this tournament. Baadur Jobava lost all his 6 games. 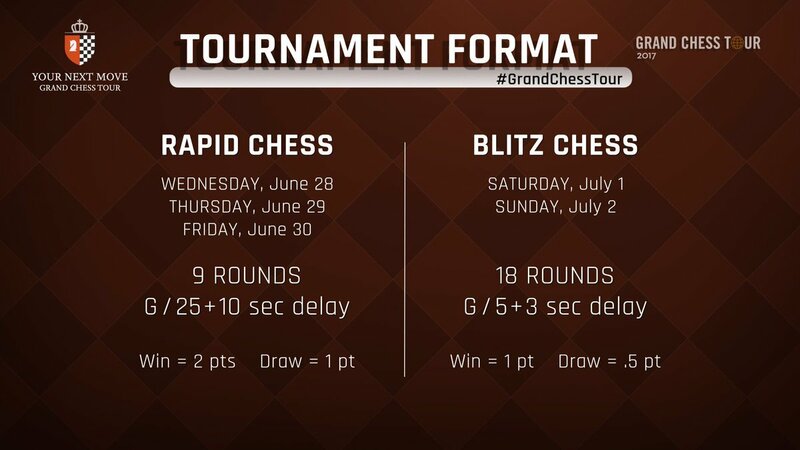 Now Anish Giri, Viswanathan Anand, and Vladimir Kramnik must be anxious that they might be the ones who won’t win against Jobava. Replay Round 4 games below. Select games from the upper left drop-down list. dxc4 9. h5 c5 10. hxg6 hxg6 11. dxc5 Qxd1+ 12. Rxd1 Bxe5 13. Nf3 Bxc3+ 14. 26. Bxd5 b6 27. c4 e5 28. b4 Ke7 29. c5 Be6 30. Bf3 Bh6 31. Bxh6 Rxh6 32.
cxb6 axb6 33. a4 Rh7 34. Rc1 f5 35. Rc6 Bd7 36. Rxb6 Bxa4 37. b5 Rh8 38. 1. d4 Nf6 2. Nf3 g6 3. Bg5 Bg7 4. Nbd2 O-O 5. e3 d6 6. Bd3 Qe8 7. O-O e5 8. 8. Nf3 e4 9. Nd4 Nf6 10. d3 d5 11. cxd5 Qxd5 12. a3 O-O 13. dxe4 Qxe4 14. Bb2 Nbd7 15. Nf3 Qe7 16. Qd4 Re8 17. Bd3 Nf8 18. Qc3 Bg4 19. Ne5 Bh5 20. O-O Rad8 21. Qb3 N8d7 22. Nc4 b5 23. Na5 Ne5 24. Bxe5 Qxe5 25. Nxb7 Ng4 26.
g3 Nxh2 27. Nxd8 Nf3+ 28. Kg2 Nd2 29. Bxh7+ Kf8 30. f4 Qf6 31. Qb2 Nxf1 32. Replay Round 5 games below. Select games from the upper left drop-down list. 1. c4 c5 2. Nf3 Nc6 3. Nc3 Nf6 4. e3 e6 5. d4 d5 6. cxd5 Nxd5 7. Bd3 Be7 8. O-O O-O 9. a3 cxd4 10. exd4 b6 11. Nxd5 Qxd5 12. Qc2 Bb7 13. Bxh7+ Kh8 14. 20. Rc1 g4 21. Ne1 Bf6 22. Rc2 Rd8 23. Kf1 Kh7 24. Ke2 Kg6 25. Nd3 e5 26. Rc7 Kf5 27. Rxa7 e4 28. Nb4 Bg5 29. Rf7+ Kg6 30. Rb7 Rd2+ 31. Kf1 Rd1+ 32. Bxe2 33. Nd7 Rf7 34. Nxf6+ Rxf6 35. Kxe2 Re6+ 36. Kf2 Kf7 37. a5 g5 38.
hxg5 Kg6 39. Rc5 f3 40. Kxf3 Re3+ 41. Kf4 Rxd3 42. a6 Rd1 43. Ra5 d3 44. 14. Nf4 Qc5+ 15. e3 Na5 16. Qb4 Qxb4 17. cxb4 Nc6 18. a3 Nd8 19. d3 Nd6 20.
axb5 27. axb5 Bxb5 28. Rxc7 Rc6 29. Rxc6 bxc6 30. Ra8 Re8 31. e5 Nd6 32. 20. Nf3 Bd6 21. Kg2 Qg4 22. h3 Qg7 23. Rad1 f5 24. Kf1 Rh6 25. Rd4 f4 26. 32. Nxg1 Bg5 33. Rg3 Bf6 34. f4 Kc7 35. Nf3 Kd6 36. Kg2 b5 37. Ng5 Ke7 38. 1. e4 d6 2. d4 Nf6 3. Nc3 g6 4. f4 Bg7 5. Nf3 O-O 6. Bd3 Na6 7. O-O c5 8. 21. Nc4 Rbb8 22. Bc2 a3 23. Rxa3 Qd8 24. Qf2 Nd7 25. Qh4 Bf6 26. Ra1 e5 27. Bxf6 Nxf6 28. Raf1 Nh5 29. f6 Kh8 30. Bd1 Ne8 31. g3 Rg8 32. R3f2 Qd7 33. Replay Round 6 games below. Select games from the upper left drop-down list. Ke6 27. Bxb6 cxb6 28. Nc4 Bc5 29. Rad1 Rxd3 30. Rxd3 Rc8 31. f3 Bg1 32. 50. Ra7+ Ke6 51. f4 Ra2 52. Kf3 Ra3+ 53. Kg4 Ra2 54. g3 Ra1 55. Ra6 f5+ 56. 1. e4 e5 2. Nf3 Nc6 3. Bc4 Bc5 4. c3 Nf6 5. d3 d6 6. O-O a6 7. a4 Ba7 8. 1. c4 e5 2. g3 Nc6 3. Bg2 h5 4. d3 h4 5. g4 h3 6. Be4 Nf6 7. Bg5 Be7 8. Bxf6 Bb4+ 9. Kf1 Qxf6 10. Nf3 Nd4 11. a3 Be7 12. Nc3 c6 13. Rg1 Nxf3 14. 45. Rg3 Qh1 46. Re3 Qa1 47. Qc3 Qg1 48. h3 Rb7 49. Kb2 Qf2+ 50. Ka3 Kg8 51. Rd3 Qc5+ 52. Ka2 Qf2+ 53. Qd2 Qb6 54. h4 Qg1 55. Rxd6 Qxg4 56. Rd8+ Kh7 57. Qe3 Qg2+ 58. Rd2 Qh1 59. c5 Qc1 60. h5 Rd7 61. hxg6+ Kg7 62. Re2 Qd1 63.
gxf7 Rd3 64. f8=Q+ Kxf8 65. Qf2+ Kg8 66. Rb2 Rd4 67. Qc2 Qg1 68. c6 Rd1 69. 1. d4 Nf6 2. c4 g6 3. g3 Bg7 4. Bg2 d6 5. Nf3 Nbd7 6. O-O e5 7. Nc3 O-O 8. 1. e4 e5 2. Nf3 Nc6 3. Bc4 Bc5 4. O-O Nf6 5. d3 O-O 6. c3 a6 7. h3 Ba7 8. Na5 15. Nb4 Nxb3 16. axb3 exd4 17. cxd4 Bd7 18. Rc1 Rac8 19. Rec3 c6 20. Replay all rapid games in Your Next Move 2017.